Meri Bahut Icchaa thi bachpan se ki ye bawani mai sai mandir (Lodhi Road, New Delhi) me beth kar padu loudspeaker pe. Ek baat to maine bachpan me sai se apne good result ke liye bola tha ki baba mere result best aayega to mai ye bawani mandir me Gaaungi. Par hamesh hasitation me he rahe gayi. Or apna ya vaada poora nahi kar saki. Aaj is online mandir me likh kar use poora kar rahi hoo. Mai khush hoo ki koi aisa plateform mila mujhe where i can write anything for baba. Sushma dear you write whatever you feel like...pour yourself here. Yeh BABA SAI ka Manch Hai...Yahan Jo Bhi Aapke Bhav Hain Woh Likhen aur Share Karein. Yahan Sab Apne Bhai Bahen Hai. Koyi Hesitation mat rakhiye. You are once again welcome here...Ravi Bhai ne yeh Online Mandir Aap aur Hum Jaise BABA SAI ke Bhakto ke liye hi to banaya hai. Do you know? BABA SAI apne aise bachon se bahut prasan hote hai jho apne Bhavon ki Abhiviyakti bina kissi sharam yan Bhedbhav Se karte hain. Kiya aap Delhi mein rahati hai? Agar Haan! Toh BABA SAI ne chaha toh hum jald milenge. Thanks Rameshji. Ji ha Rameshji maine ab apne man ki baate bolna shuru kar diya hai. Mujhe baba ka ek or Thikana mil gaya hai. I seat on computer for 8 hours and dont like to leave the seat becuase i dont want to mis it. I have joined this site around 15 days back and infact i dont bother for my boss also that he is looking me surfing all for baba. Rameshji welcome to mujhe karna chahiye aap sab sai bhagto ka apni life me. Aap jai sai bhagto ka saath mujhe milta raha to life me bahut kucch sikhati rahungi. Aap to mujhe ek Baba ke bande ke roop me lage, jo hamesha sabko bahut attention se sunte, samajhte or samjhate hai. Rameshji, ji ha i am in delhi, aapse mulakat ho aisi meri bhi kamna hai. Baba se prayer karoongi. Sushma ji if BABA SAI wishes zaroor milenge! I am working in NAFED, Ashram Chowk and live in Sheikh Sarai, Phase-II, New Delhi. If you wish you can have my id from my profile in Sai Devotees Profile. I too like interaction with Sai Devotees. सक्षम हो पा रहा हु. मैंने कभी भी सपने मे नहीं सोचा था की ऐसा होगा. बस आप और आपका परिवार केवल साईं सत्चरित का रोजाना पाठ कीजिये वही से सभी सवालो और समाधान का रास्ता बाबा आपको दिखायगे . हम सभी साईं प्रेमी आपके किये बाबा से प्राथना करेगे और आपको शिघः ही इस परेशानी से निजत के लिए मालिक से दुआ करेगे. Glory to God! Glory to Lord Sai ! Embodiment of Brahmachita Shankar ! Grant thy vision to let my eyes feast ! Simple Kafni was thy garment ! Thou appeared under holy neem tree ! Thou manisfested in this painful kali age ! Blessed Shirdi was thy holy residence ! Thou are Trinity incarnate ! Thy eyes showered love and compassion! Blest is mother masjid Dwarakamayi! Burnt were our sins and painful glory! My mind wavers like an ignorant lamb! Thou art ocean if mercy! Oh Sai! Blest was Agnihotri Mule Shastry ! Shama stung by thy infinte power ! Force of thy words could quell the storm ! Thy act of grinding wheat was a panacea ! Oh! My Lord Sainath I bow to Thee ! Thou listen to my prayer and fulfill my wish ! Bhakta Bhimaji suffered with severe malady ! Nothing is better than thy udi so efficacious ! Thou enthralled kakaji with vutthal vision ! Thou bestowed Damu with boon of progency ! Merciful Lord. Shower us with mercy ! We surrender our wealth , mind and body to thee ! Ignoratn Megha confused in casteism ! Thy grace made him to see Shiva in thee ! Thou turned water to oil for illumination ! Thy wonderful miracle stunned the vendors ! Chand patil searching for his lost mare ! Thy guidance helped him to find his mare ! Have faith in Sai with Faith and patience ! All our desires will be fulfilled by his grace ! Thou repaid Bayaja bai's loving debt ! When Tatya battled with life and death ! Wild beasts too enjoyed ehy Benignity ! Thou are omni present! Thou are Omni Potent ! One who surrenders at thy lotus feet ! Thy nectar like sayings are priceless pearls ! Thou art in every atom! Oh ! Lord Sai ! I blame myself for being full of ignorance ! Thou art protector of helpless and poor ! Have pity and mercy on me Oh! Lord Sai ! Let me praise thy glory forever till my death ! Sing Sai Bavani with Love and Devotion ! Sai stands beside his loving devotee ! 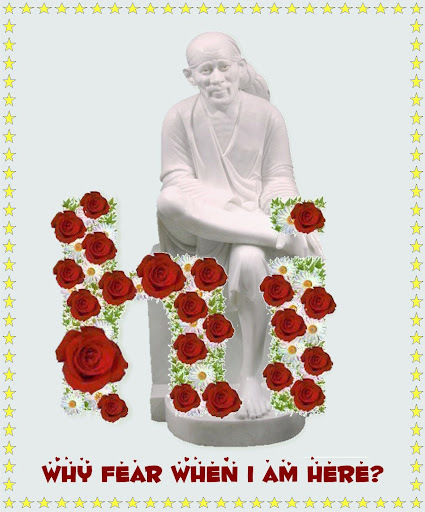 Devotion to Sai is the best Solace ! One who has immense devotion and belief ! Sai's benevolence extends to inifnity ! Glory to Lord Sai, the incarnation of Trinity ! Shri Satchit Ananda Sadguru Sainath Maharaj ki jay!